Each year on Holy Saturday during the Easter Vigil, thousands of men and women are received into the Catholic Church in the United States. New members are welcomed into the Parish through the Rite of Christian Initiation of Adults (RCIA) and at a liturgy bring men and women into full communion with the Catholic Church. 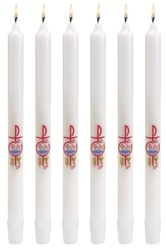 We feature several different RCIA candle styles by Emkay Candle Co. and Will & Baumer for celebrating this holy rite. RCIA Candle, 7/8" x 10"